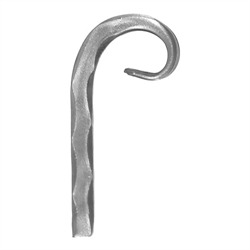 Forged Steel Hammered, Scrolled Fishtail End. 3-1/8"W, 11-3/4" Length, 1 lb. [F] Forged Steel Fishtail End. [F] Forged Steel Fishtail End. 3-3/8" Width, 11-3/4" Height. [F] Forged Steel Hammered, Scrolled Fishtail End. 3-1/8"W, 11-3/4" Length, 1 lb. [Z] Forged Steel Termination. 11-3/4" Height. [A] Forged Steel Termination. 11-3/4" Height. [X] Forged Steel Hammered Term ination. 11-3/4" Height.